" The shot was 22 yards, slight quartering away. I was shooting a 520 grain arrow at 63 pounds. The Iron Will went in right behind the right shoulder, and exited in front of the left shoulder. The arrow was stuck 6" in the ground behind the bear. We did not gut the bear but I'm certain it was a front of the lungs and heart shot. The blood trail was the bloodiest I have ever seen in 40 plus years of bow hunting. 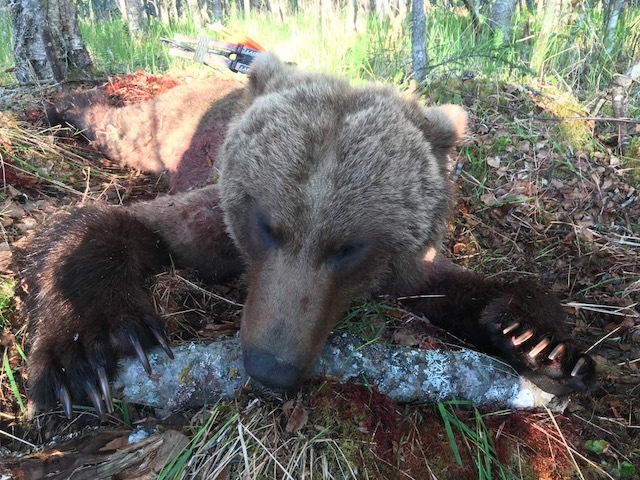 We easily found the bear about 100 yards from the shot."